Conservative operative Roger Stone claims he never discussed impending releases of Wikileaks emails with President Donald Trump during the 2016 presidential campaign, in an exclusive interview with The Daily Caller. 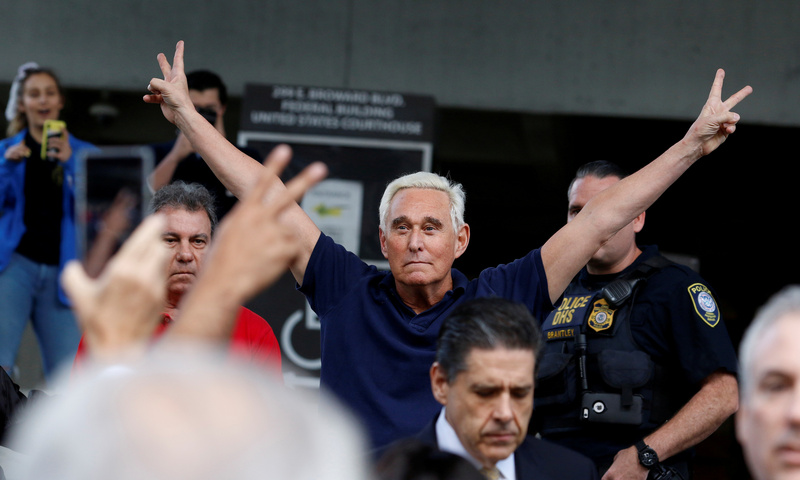 Stone was arraigned in a Washington D.C. court Tuesday afternoon on seven charges brought by special counsel Robert Mueller. Stone was indicted on seven counts Friday morning by Mueller’s team on charges of allegedly making false statements to Congress, tampering with a witness and obstructing a government investigation. Stone’s house was raided by an FBI team serving a search warrant, a scene that Stone described in detail. He said he was awakened at the crack of dawn with dozens of armed FBI agents and vehicles surrounding his property. The conservative operative said he was particularly concerned for the well-being of his wife, who is hard of hearing and was terrified of the early morning raid. Stone also detailed how he is receiving multiple death threats per day and that his family is being harassed at his residence in Florida. The indictment against Stone claims that a “senior official” on Trump’s 2016 campaign asked Stone to inquire with Wikileaks about possible impending releases of damaging information on Hillary Clinton in July 2016. Stone told TheDC he is “unfamiliar” with the email referenced within Mueller’s indictment, but noted that perhaps it needed more context. The crux of the indictment is the alleged false statements made by Stone to Congress in September 2017 testimony before the House Permanent Select Committee on Intelligence (HPSCI) about his communications with the Trump campaign regarding Wikileaks. Stone’s alleged contact with Wikileaks and Assange was a subject of serious inquiry for the special counsel, and has been the focus of rank speculation since the 2016 presidential election. Stone’s detractors long suspected that he was in direct contact with Assange during the campaign, and helped coordinate the release of damaging information on Hillary Clinton. Stone did not rule out cooperating with the special counsel’s office in the interview, noting only that he would “tell the truth,” as he believes he has done throughout the process. Despite this, the conservative operative pleaded not guilty in court Tuesday, and noted that he was intent on fighting the case all the way to trial, if necessary.